It seems like a simple question but the world of search engine marketing can get confusing and many don’t know what differentiates one area from another. Though local search overlaps with organic search in many ways, it also has a number of its own factors and qualities that are viewed or factored in different ways or amounts. 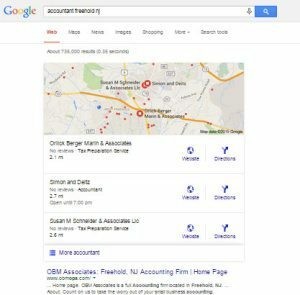 In the most simple sense, the local search world is any search that triggers local results. By local results, we refer to map listings. Google has changed the number of map pins that show up over the years in a standard search and have even added paid map listings in the process. Basically, Google, and other search engines as well, take the user intent from a search and decide whether it would trigger a local result. This can differ even by the device you are on or the location you search from, but if it triggers a local result, it triggers a set of factors and qualities that you need to be aware of. So people will tell you that many organic and local search factors overlap, but there are still certain factors that are definitely elevated in the local search world. Below are some of the big ones. Proximity: This factor you have very little control over but it is still a big factor so it is worth mentioning. It seems obvious that if your business is actually in Philadelphia, then you have a better chance in showing up for Philadelphia local searches, but this can play into or be frustrating for businesses that may actually sit just outside of a city that they are trying to target. They definitely lose out in this factor and may need to make it up considerably with other factors. Reviews: Metrics and content related to reviews appear to be some of the top factors in local search. Though every industry is relative to itself, it is important to regularly seek out reviews and do it the right way. A divorce lawyer is naturally less likely to get as many reviews as a restaurant, it is still a helpful tool. It is not just the number of reviews that matter, but the content within them. Specific mentions of services or aspects of your business can signal to Google that your business is more relevant to that type of more specific product or service. Consistent mentions of your desserts, for example, may push you up for dessert searches. Google sees reviews around the internet so don’t limit your reviews to just your Google page. Interaction: With Google trying to keep more searchers at Google and push them to websites less often, it is important to interact with your prospects and customers on your actual Google My Business page. In the end, if you convert them to customers, it doesn’t matter so much whether they made it to your site or not, but this can be harder to track. In the past year, Google has added many new ways to provide information and interaction for business owners, and most likely all are signals of what you offer and how you offer it. I would utilize all of them. Posts: Google allows posts about things going on with your business. Posts only last seven days and research has shown that regular posting pushes you up in the rankings and also can make you relevant to more specific searches. Q&A: The scary part about Q&A is that anyone can ask your business a question on the My Business page, and anyone can answer them. So you want to get out in front of this and monitor it regularly so you can control the conversation and offer true answers. You may even want to seed the Q&A with some of those old school FAQ’s to get ahead of it and again provide specific content as a ranking signal. Services and Business Descriptions: This is more obvious, but I would fill these out with as much specific information as you can to provide to Google and to the searchers. You are trying to convert them right there on the search results page. Use it. NAP’s: In local search the NAP, which stands for “Name, Address, and Phone” is somewhat like your business fingerprint online. Having consistent NAP information in important databases is important for search engines recognizing your business entity and having the confidence to show it in results. Because it was extremely important at one time, it has been abused, and some large companies have begun inventing directories that they control just so you will fail their tests and show you how much you need them. However, NAP’s are still important. It is just you need to understand which ones are important and which ones aren’t. Organic Factors: The standard organic factors also overlap with local. Domain and page link strength, speed, and general content categories of the sites attached to local listings matter.